At a young age, I experienced dog training with close family friends. After graduation, I entered the United States Army where I learned leadership and control. While stationed in Ft. Sill, OK. I worked in the military K-9 Center where I was given instruction on how to train and maintain military patrol dogs. I also joined a coursing and retrieving club off base and spent many hours working with retrievers. I finished my 6 years of military service with an honorable discharge. Upon leaving the military, I contacted All American Dog Training and completed their master training program. 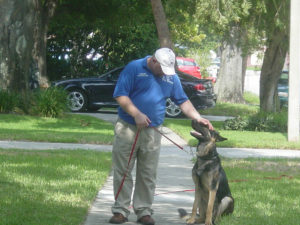 I am highly skilled in all phases of Obedience and Protection Training for your home or business. I have also completed my training for Service work for PTSD as well as being a certified CGC evaluator. 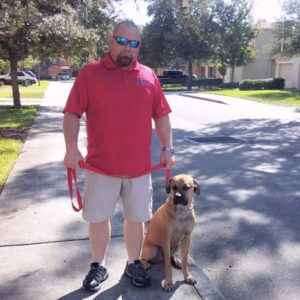 I have been working with All American Dog Training Academy for over 14 years. I can honestly say that this career is a hobby that I hope never ends. I have a teenager and 2 dogs, so I can relate to your family and your pets' needs. 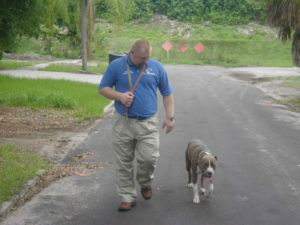 I am dedicated to making sure you get the best training I'm capable of giving to your family and your pet.